COPD is characterized by breathlessness (particularly during physical exertion), most frequently as a result of a severe expiratory airflow impairment causing a progressive pulmonary hyperinflation. The airflow limitation characterizing COPD results from the loss of the elastic recoil in the lung parenchyma, from airway hyperplasia, from fibrotic tissues, or from "peribronchial inflammation." Other reported causes of breathlessness are impairment of cardiovascular, metabolic, and respiratory processes. Administration of bronchodilators reduces dynamic hyperinflation and breathlessness by reducing the absolute pulmonary volume at which expiratory airflow impairment takes place. The use of bronchodilators in the management of symptomatic stable COPD is currently recognized as the mainstay of treatment typically associated with improvement in hyperinflation, dyspnoea, and expiratory flow resulting from smooth muscle relaxation and amelioration of the airway obstruction. There has been an increase in the number of trials conducted for COPD in the past decade involving various aspects of disease management,  many of which involves the use of bronchodilators either as monotherapy or in combination with similar mechanisms of action or with inhaled corticosteroids. Some of these trials have generated unusual, if not contradictory, results such that their interpretation should be pursued with utmost caution. Changes in baseline demographics, protocols followed in recent trials, the inclusion criteria, and the availability of newer bronchodilator agents are some of the factors that should be taken into cognizance before drawing conclusions from the generated data. Added to these are the issues of trials involving concomitant or prior treatment with other agents where carried-over effects not completely removed in the wash-out interval are likely to influence clinical outcomes. For these reasons, trial results may be better discussed within the particular context of relevance and only extended to other studies when there is a valid basis for such a comparison. The management of COPD is generally aimed at halting disease progression, improving respiratory symptoms, preventing and handling exacerbations and complications, improving exercise tolerance and patient's quality of life (QoL), and ultimately reducing mortality. These steps make the management of COPD a multicomponent theme including both pharmacological and non-drug management strategies. It is recommended that physicians adopt treatment plans that, while pursuing these generic treatment goals, tailor management first to handle the specific challenges presented in each case. Physicians are uniquely placed to identify tobacco users: physicians are recommended to actively promote tobacco use cessation as a cardinal COPD management effort. A large randomized Lung Health Study published in 2002  reported significant lung tissue preservation in patients who achieved between 85% to total cessation of tobacco use as compared to that in other patients. A comprehensive management plan is recommended to integrate disease monitoring and assessment, risk factors evaluation and reduction, and an efficient case-specific management of both stable COPD and cases of exacerbation. 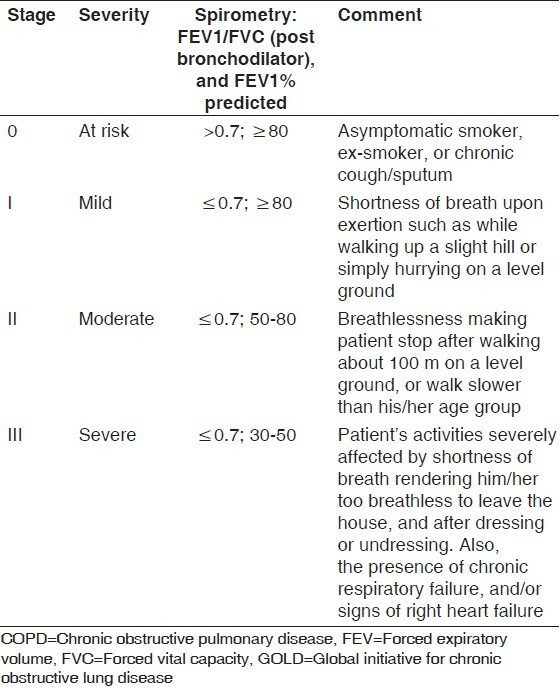 Although physical examination does not accurately represent a pathological state in COPD, the degree of presented symptoms should be employed in conjunction with results from spirometric measurement and existence of COPD complications (arterial hypoxemia, right heart failure, weight loss, and respiratory failure) while assessing disease severity. Such assessment has a direct relevance in drawing up a management plan with the early stages of the disease (I and II)-requiring both measures for risk factor avoidance and drug treatment- and the late stages (III and IV), as well as calling for a multicomponent management strategy. Measures to identify and reduce likely risk factors in each case of COPD must also be taken. The management of COPD is a nontrivial matter. It involves both the facilitation of a smoking cessation program as well as controlling symptomatic stable COPD. Owing to the disease progression pattern characterizing stable COPD, its management often requires increasing drug treatment. This is a fundamental aspect of COPD therapeutic management. Presently, there are no drugs capable of altering the disease progression or halting pulmonary function decline, and it is recommended that physicians increase dosage as needed in accordance with the growing severity of the disease. The β2 -adrenoceptor agonists, anticholinergic agents, and methylxanthines are the most prescribed, and phosphodiesterase enzyme inhibitors have also been administered in COPD. The β2 -agonists potentiate their effect by activating the G-protein coupled β2 -receptors in the wall of the pulmonary system's smooth muscles. Activation of β2 -adrenoceptors leads to a cascade of events involving activation of adenyl cyclase, formation of cAMP from intracellular ATP, and the subsequent activation of protein kinase A, which inhibits the Na + /Ca ++ pump. The resulting fall in intracellular Ca ++ causes relaxation of the bronchial smooth muscles and the pharmacological effect observed following administration of β2 -agonists. Short-acting agents are available on an as-needed basis to provide initial symptom control. The long-acting β2 -agonists, salmeterol and formoterol, however, are more effective than the short-acting fenoterol, albuterol and terbutaline, typically allowing twice daily administration (as opposed to four times daily application of the short-acting β-agonists). Formoterol and salmeterol are respectively formulated as 4.5-12 μg and 20-50 μg inhaler forms [both metered dose inhaler (MDI) and dry powder inhaler (DPI)] providing 12 hour-bronchodilatory coverage and, hence, a twice daily dosing. The inhalational formulations of the short-acting β2 -agonists are available as albuterol, 100 and 200 μg (MDI and DPI); fenoterol, 100-200 μg (MDI), and terbutaline, 400-500 μg (DPI). The oral forms (albuterol, 0.024% syrup and 5 mg tablet; fenoterol, 0.05% syrup; terbutaline, 2.5 mg and 5 mg tablet), the parenteral administration form (vials for injection: Albuterol, 0.1 and 0.5 mg; terbutaline, 0.2 and 0.5 mg) and solutions for nebulizer (available as 1 mg/ml for albuterol and 5 mg/ml for terbutaline) are also available for the short-acting agents and typically provide between 4 and 6 hours of symptomatic relief. The anticholinergic bronchodilators dilate the lung smooth muscles by blocking the muscarinic receptors, producing symptomatic relief in COPD. The long-acting tiotropium [formulated as 18 μg inhaler (DPI)] possesses a much higher receptor affinity alongside slower dissociation kinetics (approximately 100 times slower) than the short-acting agents. Tiotropium is dosed once daily. The short-acting ipratropium (inhaler, 20 and 40 μg MDI; solution for nebulizer, 0.25-0.5 mg/ml) and oxitropium (inhaler, 100 μg MDI; solution for nebulizer, 1.5 mg/ml) are usually administered thrice daily. Methylxanthines, available as theophylline (200-600 mg tablet, 240 mg injectable), and theophylline (100-200 mg tablet), provide up to 24 hour coverage. The methylxanthines potentiate bronchodilatory activity by reducing the intracellular level of cAMP, which reduces the intracellular calcium levels and brings about bronchodilation. Nevertheless, both prednisolone and methyl-prednisolone are respectively available as 5-60 mg tablets and as 4, 8, and 16 mg tablets for use in COPD. Budesonide (100 μs, 200 μs, 400 μs DPI), beclomethasone (50-400 μs MDI and DPI), triamcinolone (100 μs MDI), and fluticasone (50-100 μs MDI and DPI) are recommended for use in severe COPD (stages III and IV, and FEV1 < 50%) and COPD exacerbations. The solutions for nebulizer are also available (budesonide, 0.20 mg/ml, 0.25 mg/ml, 0.40 mg/ml; beclomethasone, 0.2-0.40 mg/ml; and triamcinolone, 40 mg/ml) and, in the case of triamcinolone, the 40 mg tablet. Combined administration of bronchodilators in the management of COPD are associated with superior therapeutic benefit and fewer side-effects and is generally preferred to increasing the dosage of a single therapy. Formulations combining short-acting β2 -agonists with anticholinergic agents are available and these include fenoterol/ipratropium combination dosed three times daily and presented as a 200/80 μg inhaler (MDI) or 1.25/0.5 mg/ml solution for nebulizer and combined albuterol/ipratropium given three times daily and available as 75/15 μg (MDI) inhaler or 0.75/4.5 mg/ml solution for nebulizer. This combination was indicated to significantly improve the FEV 1 as compared to either of the bronchodilators administered singly. Mild cases of COPD (stage I) are often managed sufficiently with short-acting bronchodilators (inhalational route) pro re nata. Symptom severity is associated with more severe stages of COPD (stages II to IV), and the short-acting agents become less optimal for controlling symptoms. In this case, a long-acting agent is recommended alone or in combination with theophylline, depending on the level of symptom control achieved. Very severe cases of COPD (FEV 1 < 50%) may necessitate inhaled glucocorticosteroids, which lower exacerbation rates and improve the QoL. Because oral formulations are generally associated with a higher incidence of adverse drug effects, the use of the inhalational forms are generally preferred for COPD treatment. Reports on the use of β-agonists as a single therapy have also indicated improvement in symptoms compared with placebo effects, which are more associated with the long-acting agents like salmeterol, rac-formoterol, arformoterol, and the ultra-long acting indacaterol and carmoterol. ,,,,,,,,,, Using trough FEV1 as a clinical endpoint, indacaterol 150 μg and 300 μg treatments after 14 days were shown to possess comparable efficacy as tiotropium  and superior effect compared to placebo treatment in moderate to severe cases of COPD. The pattern of improvement in lung function indices and COPD symptom control is, however, not limited to the long-acting β-agonists alone as there have been reports, admittedly fewer, demonstrating the efficacy of the short-acting agents compared to placebo. In 2009, Costa et al., reported improvement in the "resistive and reactive properties" in the lungs of COPD patients. There, however, appears to be a higher impetus, possibly deriving from a much wider application to investigate the role of long-acting agents in the management of COPD patients than the shorter-acting agents. Compared to the β-agonists and anticholinergic agents, the phosphodiesterase inhibitors have received much less attention, possibly as a result of an associated narrow therapeutic index and a higher incidence of adverse events reported for theophylline. Apart from a modest improvement in acid-base homeostasis, no further effect on the course of disease was recorded after treatment with theophyline. There is evidence, however, that the newer PDE inhibitor, roflumilast, is associated with better clinical efficacy. This is likely due to the augmentation of efficacy resulting from by its anti-inflammatory activity. ,, Roflumilast selectively inhibits PDE4 enzyme and possesses demonstrable efficacy at reducing exacerbation rates. It is presently licensed as 500 μg tablets in Europe and the US indicated for use in severe COPD to reduce the frequency of exacerbations. It is administered four times daily. The progressive course of COPD will likely cause an inadequate control of symptoms and attempts to optimize therapy include combining bronchodilating agents with mechanisms of action and dosage in accordance to disease severity. There are several possibilities when considering a particular drug combination and the final selection is influenced by a need to individualize therapy. Studies have demonstrated superior clinical benefits in combination treatment over monotherapy. Different bronchodilator combination regimens involving tiotropium with long-acting β-agonists such as formoterol and salmeterol were reported to significantly improve lung function and symptom control compared to these agents administered alone. In a 6-week double-blind trial with 605 patients randomized between tiotropium plus formoterol and salmeterol plus, the inhaled corticosteroid fluticasone, superior respiratory endpoints of peak FEV 1 in the tiotropium-formoterol group suggested better lung function improvement over that in the other treatment group. There is currently a need for large randomized trials to assess the impact of bronchodilator therapy on long-term benefits derivable from treatment. Some of these agents are likely to witness increasing use in the management of stable COPD as newer drugs progress through clinical trials and become available in the clinics. With the superior benefit demonstrated in combination therapy, concerns about safety of co-administration is likely to influence future trials designed to gain insight into the toxicity patterns likely to be associated with different combination options. 1. Sequeira K, Stewart D. Pathophysiology of asthma and COPD. Clin Rev 2007;140:S6-7. 2. American Thoracic Society/European Respiratory Society Task Force. Standards for the diagnosis and management of patients with COPD. [Internet]. Version 1.2. New York: American Thoracic Society; 2004. Available from: http://www.thoracic.org/go/copd. 2004. [Last updated on 2005 Sep 8]. 3. Rodriguez-Roisin R. The airway pathophysiology of COPD: Implications for treatment. COPD 2005;2:253-62. 4. Fromer L, Cooper CB. A review of the GOLD guidelines for the diagnosis and treatment of patients with COPD. Int J Clin Pract 2008;62:1219-36. 5. O′Donnell DE, Hernandez P, Kaplan A, Aaron S, Bourbeau J, Marciniuk D, et al. Canadian Thoracic Society recommendations for the management of chronic obstructive pulmonary disease-2008 update-highlights for primary care. Can Respir J 2008; 15 Suppl A: 1A-8. 6. Diaz PT, Bruns AS, Ezzie ME, Marchetti N, Thomashow BM. Optimizing bronchodilator therapy in emphysema. Proc Am Thorac Soc 2008;5:501-5. 7. Soriano JB, Miravitlles M, Borderías L, Duran-Tauleria E, García Río F, Martínez J, et al. Geographical variations in the prevalence of COPD in Spain: Relationship to smoking, death rates and other determining factors. Arch Bronconeumol 2010;46:522-30. 8. Donohue JF, Sheth K. Asthma and COPD: Management strategies for the primary care provider, 2006. Available from: http://www.cmecorner.com/programs.asp?ProductID=326 and audience=Physicians [Last Accessed on 2011 Dec 22]. 9. Fishman A, Martinez F, Naunheim K, Piantadosi S, Wise R, Ries A, et al. A randomized trial comparing lung-volume reduction surgery with medical therapy for severe emphysema. N Engl J Med 2003;348:2059-73. 10. Respiratory Review Panel. Respiratory guidelines (asthma and COPD) for family practice. 2 nd ed. Toronto: MUMS Guidelines Clearinghouse; 2007. 11. Pauwels RA, Buist AS, Calverley PM, Jenkins CR, Hurd SS; GOLD Scientific Committee. Global strategy for the diagnosis, management, and prevention of chronic obstructive pulmonary disease. NHLBI/WHO Global Initiative for Chronic Obstructive Lung Disease (GOLD) workshop summary. Am J Respir Crit Care Med 2001;163:1256-76. 12. Guidelines and Protocols Advisory Committee: Chronic obstructive pulmonary disease (COPD). BC Medical Association, 2011. 13. Anthonisen NR, Connett JE, Murray RP. Smoking and lung function of Lung Health Study participants after 11 years. Am J Respir Crit Care Med 2002;166:675-9. 14. A clinical practice guideline for treating tobacco use and dependence: A US Public Health Service report. The Tobacco Use and Dependence Clinical Practice Guideline Panel, Staff, and Consortium Representatives. JAMA 2000;283:3244-54. 15. Lancaster T, Stead L, Silagy C, Sowden A. Effectiveness of interventions to help people stop smoking: Findings from the Cochrane Library. BMJ 2000;321:355-8. 16. Barnes PJ. Beta-adrenergic receptors and their regulation. Am J Respir Crit Care Med 1995;152:838-60. 17. Sindi A, Mclvor A. The use of inhaled anticholinergics in chronic obstructive pulmonary disease: Is there cause for concern? A review of evidence from clinical trials. Pol Arch Med Wewn 2009;119:74-8. 18. Decramer M, Stas KJ. Corticosteroid-induced myopathy involving respiratory muscles in patients with chronic obstructive pulmonary disease or asthma. Am Rev Respir Dis 1992;146:800-2. 19. Spencer S, Calverley PM, Burge PS, Jones PW. Impact of preventing exacerbations on deterioration of health status in COPD. Eur Respir J 2004;23:698-702. 20. van der Valk P, Monninkhof E, van der Palen J, Zielhuis G, van Herwaarden C. Effect of discontinuation of inhaled corticosteroids in patients with chronic obstructive pulmonary disease: The COPE study. Am J Respir Crit Care Med 2002;166:1358-63. 21. Lipworth BJ, McDevitt DG, Struthers AD. Hypokalemic and ECG sequelae of combined beta-agonist/diuretic therapy. Protection by conventional doses of spironolactone but not triamterene. Chest 1990;98:811-5. 22. Pauwels RA, Lofdahl CG, Laitinen LA, Schouten JP, Postma DS, Pride NB, et al. Long-term treatment with inhaled budesonide in persons with mild chronic obstructive pulmonary disease who continue smoking. European Respiratory Society Study on Chronic Obstructive Pulmonary Disease. N Engl J Med 1999;340:1948-53. 23. Johnell O, Pauwels R, Lofdahl CG, Laitinen LA, Postma DS, Pride NB, et al. Bone mineral density in patients with chronic obstructive pulmonary disease treated with budesonide Turbuhaler. Eur Respir J 2002;19:1058-63. 24. The Lung Health Study Research Group. Effect of inhaled triamcinolone on the decline in pulmonary function in chronic obstructive pulmonary disease. N Engl J Med 2000;343:1902-9. 25. Johansson G, Lindberg A, Romberg K, Nordstrom L, Gerken F, Roquet A. Bronchodilator efficacy of tiotropium in patients with mild to moderate COPD. Prim Care Respir J 2008;17:169-75. 26. Heredia JL. Tiotropium bromide: An update. Open Respir Med J 2009;14:43-52. 27. Matsuyama W, Mitsuyama H, Koreeda Y, Higashimoto I, Osame M, Arimura K. Use of tiotropium bromide for pre-operative treatment in chronic obstructive pulmonary disease patients: Comparison with oxitropium bromide. Intern Med 2007;46:1373-9. 28. Casaburi R, Kukafka D, Cooper CB, Witek TJ Jr, Kesten S. Improvement in exercise tolerance with the combination of tiotropium and pulmonary rehabilitation in patients with COPD. Chest 2005;127:809-17. 29. Matera MG, Sanduzzi A, Ponticiello A, Vatrella A, Salzillo A, Cazzola M. An acute bronchodilator test with tiotropium or salmeterol does not allow a subdivision of patients according to responses. Respiration 2005;72:466-70. 30. Vogelmeier C, Hederer B, Glaab T, Schmidt H, Rutten-van Mölken MP, Beeh KM, et al. Tiotropium versus salmeterol for the prevention of exacerbations of COPD. N Engl J Med 2011;364:1093-103. 31. Costa GM, Faria AC, Di Mango AM, Lopes AJ, Jansen JM, Melo PL. Bronchodilation in COPD: Beyond FEV1-the effect of albuterol on resistive and reactive properties of the respiratory system. J Bras Pneumol 2009;35:325-33. 32. Kato M, Makita H, Uemura K, Fukuchi Y, Hosoe M, Emery C, et al. Allergol bronchodilator efficacy of single doses of indacaterol in Japanese patients with COPD: A randomised, double-blind, placebo-controlled trial. Allergol Int 2010;59:285-93. 33. Chazan R. Efficacy and safety of indacaterol-new long-acting beta-2 agonist. Pneumonol Alergol Pol 2010;78:229-35. 34. King P. Role of arformoterol in the management of COPD. Int J Chron Obstruct Pulmon Dis 2008;3:385-91. 35. Rubin AS, Souza FJ, Hetzel JL, Moreira Jda S. Immediate bronchodilator response to formoterol in poorly reversible chronic obstructive pulmonary disease. J Bras Pneumol 2008;34:373-9. 36. Cazzola M, Matera MG. Novel long-acting bronchodilators for COPD and asthma. Br J Pharmacol 2008;155:291-9. 37. Whale CI, Sovani MP, Mortimer KJ, Harrison TW, Tattersfield AE. Systemic and bronchodilator effects of inhaled rac-formoterol in subjects with chronic obstructive pulmonary disease: A dose-response study. Br J Clin Pharmacol 2008;65:841-7. 38. Duffy N, Walker P, Diamantea F, Calverley PM, Davies L. Intravenous aminophylline in patients admitted to hospital with non-acidotic exacerbations of chronic obstructive pulmonary disease: A prospective randomised controlled trial. Thorax 2005;60:713-7. 39. Izquierdo Alonso JL. Clinical profile of roflumilast. Arch Bronconeumol 2010;46:25-32. 40. Price D, Chisholm A, Ryan D, Crockett A, Jones R. The use of roflumilast in COPD: A primary care perspective. Prim Care Respir J 2010;19:342-51. 41. Giembycz MA, Field SK. Roflumilast: First phosphodiesterase 4 inhibitor approved for treatment of COPD. Drug Des Devel Ther 2010;21:147-58. 42. Miravitlles M. Individually-tailored treatment of chronic obstructive pulmonary disease: A proposed change. Arch Bronconeumol 2009;45:27-34. 43. Dransfield MT, Bailey W, Crater G, Emmett A, O′Dell DM, Yawn B. Disease severity and symptoms among patients receiving monotherapy for COPD. Prim Care Respir J 2011;20:46-53. 44. Yildirim N. Inhaled corticosteroid/beta-2 agonist therapy in moderate COPD. Tuberk Toraks 2010;58:192-201. 45. Fernandes FL, Pavezi VA, Dias SA Jr, Pinto RM, Stelmach R, Cukier AJ. Short-term effect of tiotropium in COPD patients being treated with a beta2 agonist. J Bras Pneumol 2010;36:181-9. 46. Soler-Cataluña JJ, García MA. Impact of efficacy and mortality studies (TORCH and UPLIFT) in bronchodilator treatment of chronic obstructive pulmonary disease. Arch Bronconeumol 2009;45:14-20.